As the final days of 2015 come to a close it's only fitting to look ahead and see what 2016 will bring to the Fuji X-Series. New cameras and new lenses are just on the horizon, but what else might we expect from Fuji, and what other ways might we get some added incentive to being X-Series users? Let's take a closer look at what we can expect in 2016 and share a bit of speculation about what might be just around the bend. The cat is pretty much out of the bag on this one. It's no secret that Fuji would eventually update their flagship rangefinder style interchangeable lens camera, but now all signs strongly point to a mid-January 2016 reveal. The strongest evidence for this was actually a slip by Magnum Photos in mid-November. Fujirumors, a site that dedicates itself to revealing information on future Fuji products, posted a screenshot of EXIF data (below) that clearly shows that Magnum Photographer Hiroji Kubota was using a Fujifilm X-Pro2 on November 14, 2015. 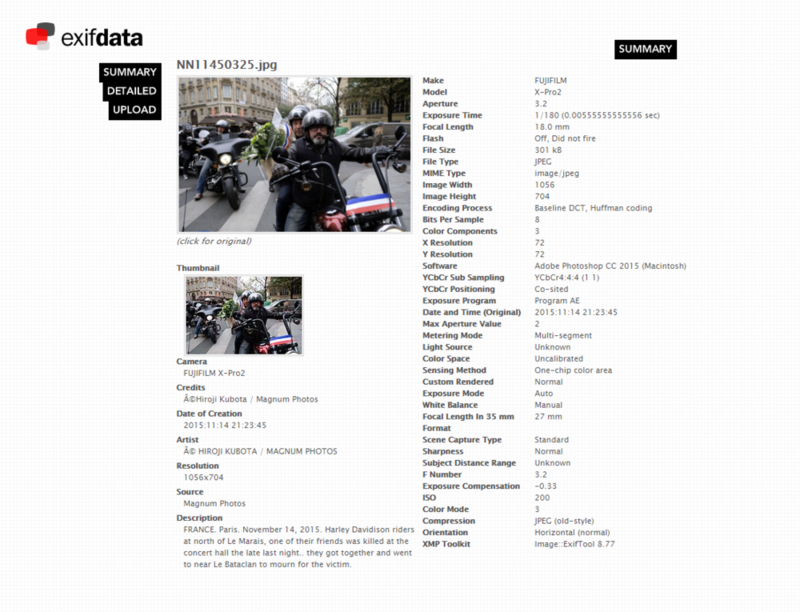 EXIF data nowadays is pretty rock solid, as it can be used in court to win cases. Screenshots like this may as well be the modern day equivalent of leaving your iPhone prototype at a bar, because there's no turning back from that. So at that point we knew the X-Pro2 was in the wild, but we didn't know when it might be released. Cut to three days later and Magnum Photos once again oversteps a bit, retracts the images (along with their EXIF data) and instead, as Fujirumors reported on November 17th, posts this: "Embargo till Jan. 15 2016 due to contract with the camera manufacturer". That statement has also since been retracted from their site, presumably when someone at Fuji called Magnum and said, "Guys? Seriously?!" To further cement the likely January reveal, Fujifilm's "5 Years of X-Series Event" happens next month in Japan. The weeklong event will feature live talks, the first of which happens the morning of January 16. That's convenient timing. So yes, the X-Pro2 is coming. As for specs or product images, I only nod at the rumors and take everything with a grain of salt. I'm satisfied that it's on it's way, but I don't subscribe to much of the other talk until it's all officially announced. Note: if it's not announced in January, I'll be sure to eat my hat. On top of all of that, most resellers including Amazon and B&H seem to be clearing out their stocks of X-Pro1's with very low prices and bundle deals. No doubt they're making room for the new model. The XF 120mm and the XF 100-400mm are the only two officially announced outstanding lenses on Fuji's Lens Roadmap for a 2016 release. Not much has been said about either lens, but it's possible that we will see or hear about both of them at the Fuji X-Series event in January. Between the two of them, I think most of us are very eager to see the XF 100-400mm. Judging from the 50-140mm, this new telephoto lens is already positioned at being the heaviest and most expensive lens in the X-Series lineup. I believe Fuji has been tweaking the actual focal length and aperture of this lens for a while now in an effort to make it feasible to own and carry, but we'll have to wait a bit longer to see how well they've managed to accomplish that. 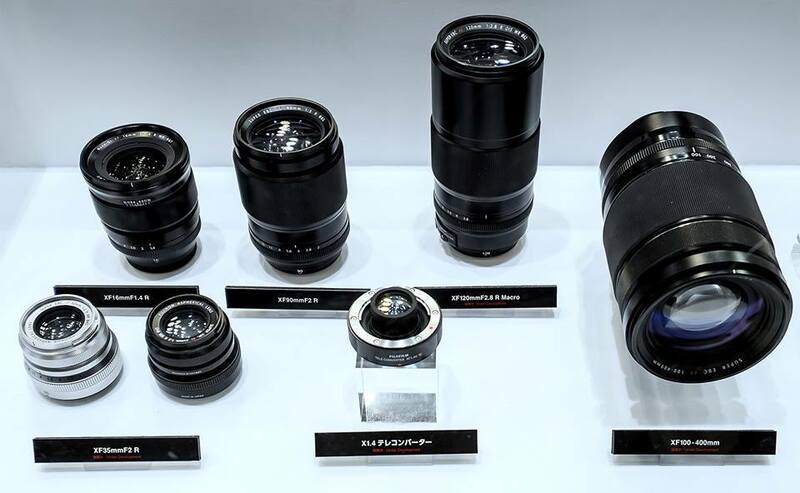 In the image below, we can see the XF 120mm f/2.8 and the XF 100-400mm next to the recently released 16mm f/1.4, 90mm f/2.0, 35mm f/2.0 and the 1.4x teleconverter. This is one area where I think Fuji really stands out and I think we'll see even more of it in 2016. Fuji has always made great connections with professional photographers who use their X-Series gear (X Photographers) and Fuji listens to their input when designing their products and working out their roadmaps. But I'm also happy to see Fuji getting very involved in social media, especially on Facebook and Twitter. I've been seeing a lot of posts and retweets of great photos from other X-Series users and it's refreshing to see a company as involved as Fuji. We've also seen Fuji being very involved with local camera stores in various markets and in various countries, and that's an important part of fostering that tight-knit community. In some cases, they even offer extra discounts on X-Series gear or free talks with visiting X Photographers, so if you can make it to one of these events I'd encourage you to do so! Also be on the lookout for other photo walks or galleries in your area. The community you choose to be a part of doesn't have to be Fuji-centric of course, but I find that if you're trying to get up to speed on Fuji's gear it's helpful to be around at least one or two other X-Series users. And if you're absolutely just not in an area where you can get out and meet other X-Series users, don't fret. I really enjoy the community over at the Fuji X Forum and highly suggest joining in on the conversations and topics there. With the X-Pro2's imminent arrival right around the corner, we might see some people opting to switch to the newer body and part ways with their X-Pro1 or X-T1. Keep an eye on the used forums! We'll continue to see firmware updates from Fuji in 2016, although what they would address is still up in the air. First and foremost, Fuji will correct and re-distribute the flawed firmware 4.20, and we'll probably see that sometime in January as well. They've made 4.21 available if you've downloaded 4.20, which essentially just brings your X-T1 back to 4.10 status. Other than that, I'm hoping that the X-E2 firmware gets announced, and I'm sure the X-Pro2 will see some firmware tweaks in it's first year as well. The only other model camera that I think Fuji would consider upgrading (at a software level), besides the X-T1, X-E2 and X-Pro2 would be the X100T. I'm at a loss as to what might actually be tweaked on that camera, however. Be sure to post a comment below if you have some ideas about what could be tweaked on the X100T. It's been suggested that the X-Pro2 may carry a new film simulation with it, and I'm all for that. I really love what Fuji can accomplish with these profiles, and I hope whatever does get revealed will eventually make it to the X-T1 as well. The X-T1, X-Pro2 and X100 lineups are not the only Fuji X-Series cameras out there. The X-A2, X-M1 and X30 are still going strong and they might also see some firmware improvements. It's possible that new additions to this lineup may be announced in January, as well (an X70 is rumored). Fuji recently held two photo contests: their 5th Anniversary Fujfilm X World Photo Contest and their Fujifilm Black and White Photo Contest. This type of involvement goes hand in hand with what I was saying before about community, and I wouldn't be surprised to see more Fuji contests crop up in 2016. Someone at Fuji realized that they needed to interact with parallel markets in order to get their brand out there, and by giving away their X-T10 at Adobe MAX they instantly got the attention of over 7,000 people who were Adobe users - and most likely existing Adobe Photoshop and Lightroom users. By putting the camera in attendees' hands, they immediately got the X-Series noticed and by doing so opened up a huge new customer base with a single announcement. We might see Fuji offer other giveaways or cross-promotions with related creative industries. We might also see new official programs, such as their new Education Program, be unveiled next year. Even though that education offer expires in January 2016, it may be renewed for other time periods in 2016. Speaking of Fuji programs, let's also not forget about the Fuji Pro Rental Service, either. If you'd like to try X-Series gear or need a part of your kit replaced while the part you own is in for service, remember that they've made this program available to you. Another new program that I'd like to see is some kind of official technical feedback forum or social media account run by Fujifilm Technical Support. Many new X-Series users have concerns over the "chatty" focus on the 35mm f/1.4 and other first generation lenses, and with the firmware updates offering more complex customization features it'd be nice to have a place to go to speak with Fujifilm technical support staff directly if a question arises. We do a lot of troubleshooting over at the Fuji X Forum and a quick Google search is sometimes all it takes, but it would be great to see a program rolled out where a brief Tweet, Live Chat, Facebook post or forum post could be answered by Fuji tech support staff in near realtime. I'd love to see either Tokina or Sigma (or both) come into the field and offer some native X-mount lenses. Admittedly though, Fuji makes amazing glass. Entering this market and competing with Fuji would be tough for them to justify, except on the long end. Fast, native third party telephoto zooms or long primes would be great. Despite the competition with Fuji, entering this market could still work in their favor. The only current native X-mount lens that I own that is not a Fuji lens is the Rokinon 12mm f/2.0. It's a prime lens whose price point and focal length isn't really matched by Fuji, so they've marketed it well. Tokina and Sigma could potentially do the same by matching Rokinon's strategy. XF 33mm f/1.0: I'm not sure if I'd be in the market for it, but I'd love to see what this lens would look like if produced. 23mm f/2.0:. The 35mm f/2.0 features improved autofocus in a weather sealed body compared to it's f/1.4 brother. I'd really love to see Fuji do something similar for the X-Series interchangeable cameras with a smaller, lighter, faster and weather sealed 23mm f/2.0. I would even trade my beloved distance scale and hard stops in the current 23mm f/1.4 for this lens, if only to get the smaller size that I crave. Note: I really love the hard stops on the 23mm f/1.4 lens, so believe me when I tell you that it was very hard to type that last sentence. 2015 has been great for Fuji, but I can already tell that they are ramping up to start 2016 off with a bang. Do you have any ideas or hopes for the X-Series in 2016? Feel free to keep the discussion going in the comments below.